It is with much appreciation we announce the donation by the Pooler First Responders Luncheon Committee. 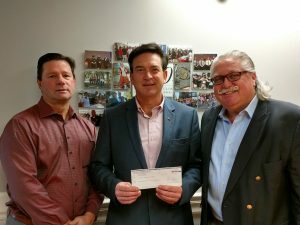 Pete Chaison and Paul Graham, two of the organizers of the Pooler First Responders Luncheon, which is in its third year, presented a check for $1669.47 to Mark Dana for the Two Hundred Club and the families we honorably serve. Every year Pooler has a luncheon to honor the first responders of Pooler. They raised $5008.41 which was split evenly between the Pooler Police Association, Pooler Firefighters Association, and the Two Hundred Club.